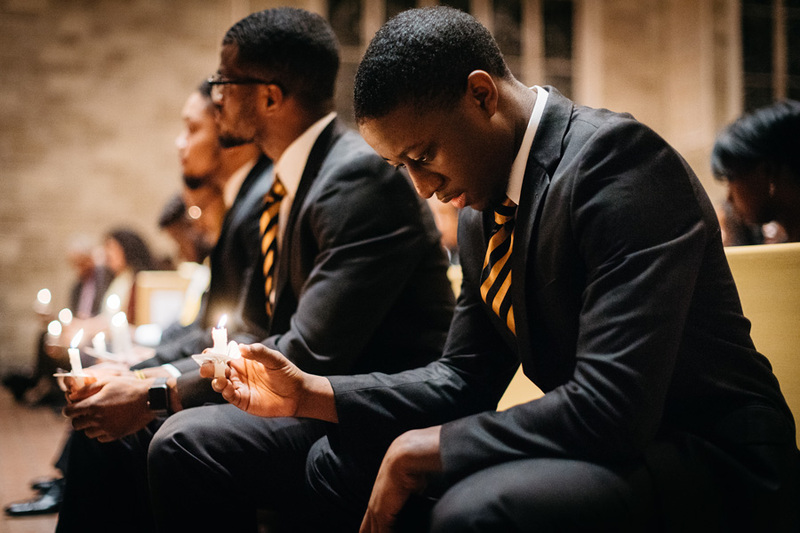 Brothers of Alpha Phi Alpha sit in silence as they hold their candles to honor the legacy of Martin Luther King, Jr. in January 2017. This year’s MLK Commemoration will include a new MLK Arts Festival Jan.18-20. The annual Martin Luther King, Jr. Commemoration will include a new MLK Arts Festival, which seeks to elevate black student voices through performance and discussion, festival producers said. To honor Martin Luther King, Jr., Vertigo Productions will sponsor the festival, which will take place Jan. 18 to 20. It includes two original student productions in Shanley Pavilion and two catered events in McCormick Auditorium — a discussion called “Inside Chicago” and a music and poetry event, Lift Ev’ry Voice. Communication junior Elliot Sagay wrote one of the student productions, “Chains on Chocolate.” To write about slavery in pre- and post-emancipation America, Sagay said he thought about an experience he had on the subway and current political shifts. He also said he drew inspiration from King. This is the 50th anniversary of both King’s assassination and, on campus, the Bursar’s Office takeover. The takeover lasted 38 hours when black students occupied one of the University’s offices with a demands list that called for fairer admissions, more programs in black culture and real estate holdings desegregation, The Daily reported in 1968. Arts Festival Producer Kori Alston said these performances and discussions are a way to honor the takeover’s legacy. “Afrocensored,” the other student production, focuses on three women who find themselves in Paris and confront Islamophobia, colorism and racism. Amira Danan, writer of the play, said she based her work on her own experiences, such as when she traveled to Paris and realized problems people may see in America are more wide-reaching. “In thinking about the underbellies of our country and France — other countries outside of our country — I think that there are definitely a lot of parallels about how we disguise things like racism in our society,” Danan said. In each of the events at the Arts Festival, Alston said people will get the chance to see and confront continuing problems in society. Beyond the festival, the University will begin its commemoration Monday with a candlelight vigil and Days of Service and Learning, University President Morton Schapiro said in an email to the community. Then, on Jan. 25, New York Times columnist Charles M. Blow will deliver the keynote address in Ryan Auditorium. Sagay said as a person of color, he knows the goals King worked toward are not yet accomplished.